Glenavon made a double swoop on Tuesday night with Paddy McCourt and Guy Bates joining the Lurgan Blues. The arrival of former Northern Ireland international McCourt is a huge boost for the club, but the return of Bates will raise eyebrows among the Glenavon faithful. Gary Hamilton with new signings Guy Bates and Paddy McCourt. The 30-year-old striker scored 26 goals in over 50 games with Glenavon before departing for Australia to work for a family business. He admits the club is even better now than when he left. “When you look at the quality here it is no surprise they are a club on the up. Both Linfield and Cliftonville were keen to sign 32-year-old McCourt, but Glenavon won the race for his signature. McCourt has a wealth of experiecne having played full-time with Rochdale, Barnsley, Brighton, Luton Town and Celtic. He has also 18 international caps. 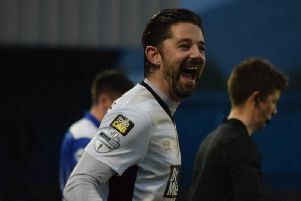 “Glenavon were challenging for the league last year and ended up winning the cup so coming here ticked a lot of the boxes for me,” said Paddy.